What to look for in a shave den cabinet? 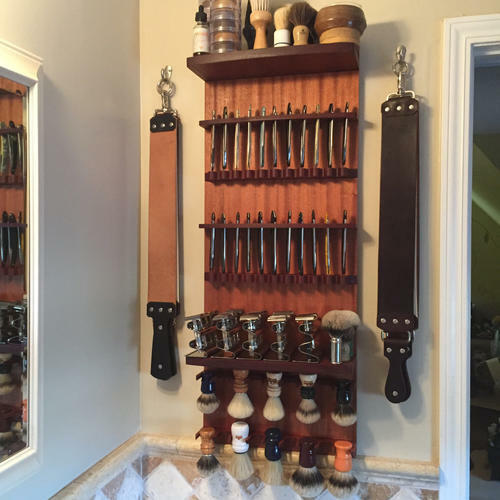 Thread: What to look for in a shave den cabinet? My wife would like me to get a razor/shaving cabinet for our bathroom to organize my stuff. She found, as an example, the one pictured below on Etsy. However, the woodworker who made it will build custom designs. What features would you want to have in a cabinet like this? 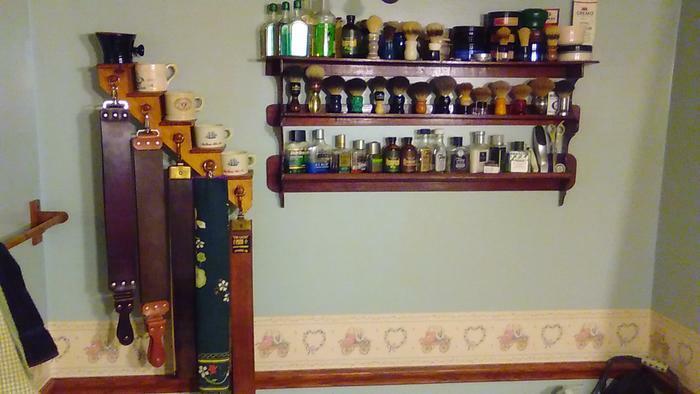 I'm thinking it should have at least a couple shelves for soaps, aftershaves, etc. I like the hanging brush storage, but maybe five would be enough. (Either that, or I have not gotten the brush acquisition bug yet!) Maybe a drawer would be nice, and maybe a small section with a door. Right now, my razors are on the dresser in the bedroom, in a test tube rack from Amazon. She really wants them in the new cabinet. I told her about the concern with humidity, but fortunately the bathroom is roomy enough that it is not too bad. But maybe I should have the razor section enclosed, with a glass door. Here is a picture of the one she found. (https://www.etsy.com/listing/4632672...op_home_feat_4). We didn't do an extensive search for craftsmen yet, but this fellow has a number of shaving-related items. If anyone has a tip about where to look for shaving den cabinets, that would be appreciated also. Speedster, markbignosekelly, Haroldg48 and 3 others like this. I like the type that you can recess into the wall. Doesnt stand out or have as many opertunities cor things to get knock off. Lots of options if your going to have one made. I like to have just a couple things in the bathroom and keep most of my stuff elsewhere. So keep that in mind. You dont neex to have every razor and brush and soap on hand in the bathroom. Just something else to think about when figuring out what you want to have made. ScoutHikerDad, Geezer, markbignosekelly and 3 others like this. Here is a link to his shop: https://www.etsy.com/shop/wayne2k?re..._shop_redirectWayne built me a great cabinet for a good price in a timely fashion. Honestly, though, the one you're looking at is probably more practical for serious razor display. I would be afraid to have an enclosed cabinet in a bathroom, and in fact run a dehumidifier in mine as necessary. 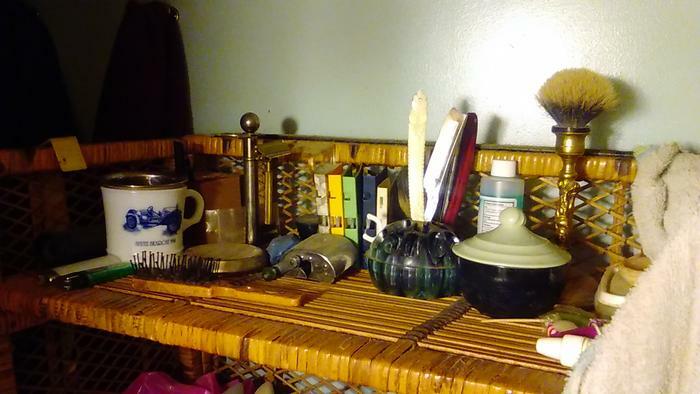 In fact, I'm considering getting something like that mostly for razors, and keep the glass-fronted one I have more for "apothecary" stuff as my wife calls it: soaps, brushes, cool after-shave bottles, DE's, etc. Show us pics of what you get in any case! Last edited by ScoutHikerDad; 02-09-2019 at 08:28 PM. Geezer, markbignosekelly, jfk742 and 3 others like this. Haroldg48, jfk742, MikeT and 1 others like this. The most important thing is whatever size you are looking at buy bigger, much bigger because down the road you will need it. ScoutHikerDad, Haroldg48, outback and 5 others like this. That is sage advice! I remember wondering why I would need with 2 razors. ScoutHikerDad, Geezer, outback and 2 others like this. Your very own walk in closet might be a good size to start with. ScoutHikerDad, Geezer, 32t and 7 others like this. That depends on what you want to achieve, I think. 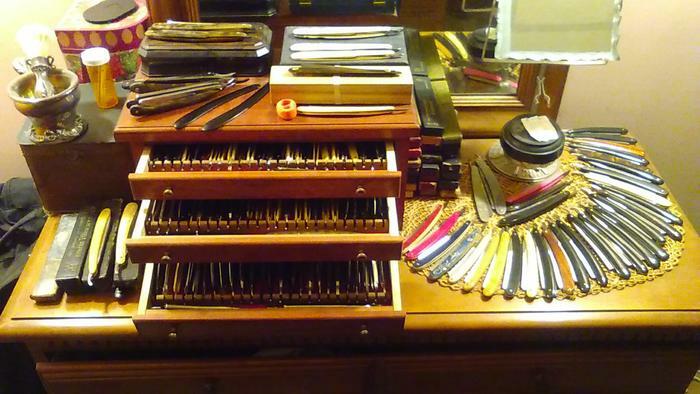 At the current going rates, filling the Etsy rack with cut-throat and safety razors, and brushes actually worth displaying would set you back by US$ 10,000. Unless you want to showcase mediocre razors, in which case yes, buy bigger, much bigger. I don’t think offering that option to his wife would be a very diplomatic thing to do. criswilson10, outback, MikeT and 2 others like this. I had to laugh at that remark, cause I'm not far from that. I got a whole wall in the den almost filled, and a small shelf on the towel rack that my wife uses for her stuff. Then my dresser drawers are smothered in razors. The wife has a really nice, lighted, curio cabinet, upstairs. Euclid440, markbignosekelly, RezDog and 11 others like this.